What is the nearest MBTA Station? Government Center Station on the Green & Blue Lines. Depart the station, turn around 180 degrees away from City Hall and then cross Court Street. King's Chapel and the burying ground are one block away down Tremont Street on your left. What is the cost? King's Chapel Burying Ground is a public cemetery and is free to visit. How long does it take to visit? About 20 minutes, but one can take 1-2 hours or more if many markers are visited. Where is Governor Winthrop's marker located? Enter the front gate and walk down the path on the left. Take the immediate path on your left. There is a wide tall stone marker, and a tomb. The tomb is believed to be the final resting place of Governor Winthrop. Where is Reverend John Cotton's marker located? Enter the front gate and walk down the path on the left. Take the immediate path on your left. There is a wide tall stone marker, and a tomb. The wide marker is that of John Cotton; the inscription is on the street side of the stone. 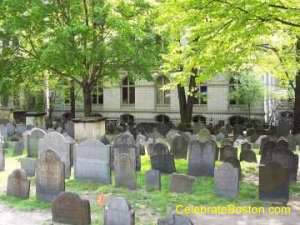 What is the strangest fact about the burying ground? That Patriot William Dawes, Jr. is buried here. William Dawes' remains were moved to Forest Hills Cemetery (May family tomb) on March 30, 1882 (his remains probably spent a year or two in the Coolidge or May Tombs at Central Burying Ground in 1880-81, or were placed there originally). In 1899, a plaque for William Dawes was later placed on the Dawes Family tomb at King's by the Sons of the Revolution. This plaque has been the source of information for countless guidebooks ever since. Another strange story once asserted that someone was buried alive here in about 1820. What is the biggest myth about the burying ground? That the life of Elizabeth Pain had inspired Nathaniel Hawthorne to write The Scarlet Letter. In reality, it was Elizabeth Pain's marker, with its finely carved shield, that inspired Hawthorne to describe her headstone in The Scarlet Letter. The wife of another man that is buried at King's Chapel, who had been punished for adultery, was likely the true influence to Nathaniel Hawthorne. What is the 2nd biggest myth about the grounds? That Mary Chilton was the first female passenger aboard the Mayflower to step ashore at Plymouth Rock. Both of Mary's parents had died during the Mayflower voyage. In reality, due to the culture of 1620, it is extremely unlikely that a female would have been part of that first landing party, and even more unlikely that a 14-year old orphan girl would have been brought ashore initially.